We’ve compiled a list some of the most prominent companies providing IoT solutions to consumer retailer brands. Qliktag IoT Connected Smart Products Platform allows brands and manufactures to assign a QLIKTAG or internet identifier to everyday consumer products and allows them to participate in the Internet of Things. Enabling products to maintain a digital twin of themselves on the internet, which can be written to or read from using sensors on packaging and also with directly connected devices such as smartphones, barcode scanners, RFID scanners and more, expands the scope of IoT to a whole range of smarter retail and consumer applications such as personalized customer experiences, smart packaging & labelling, product recall management, reordering actions and much more. Evrythng offers smart products platform and IoT services for consumer goods. Their Product Management and Data Management features allow retailers to maintain digital identities and real-time data to drive IoT applications and give consumer products a digital life. Thinfilm NFC mobile marketing solutions allow brands to enable digital experiences with the help of smartphones. Its NFC open sensors technology or ‘smart tags’ offer end-to-end marketing solutions for brands and retailers. Moreover, Thinfilm’s Product Authentication software offers global anti-counterfeit protections and product diversion detection. Gimbal provides mobile marketing and advertising solutions to brands and retailers with the help of technology like location SDKs, geofences and beacons. Moreover, the Gimbal location management platform helps retailers maximize their mobile strategy and enhance the customer experience in real-time. Kaa is an IoT middleware technology applicable for enterprise IoT development. It provides a range of features that allow developers to build advanced applications for smart products, flexibly manage their device ecosystems, orchestrate end-to-end data processing, and many more. Wise Shelf helps retailers optimize their in-store inventory and data by making regular shelves ‘wise’. These wise shelves are equipped with light sensors that immediately send data to management indicating restocking of the particular product when stock levels go down. The LEDs and sensors allow the physical shelves to participate in the Internet of Things. The platform is great for managing inventory and real-time store data improving supplier visibility while enhancing the customer experience. Swirl is a mobile presence management and marketing platform for retailers. Using geofencing, WiFi and BLE, Swirl helps retailers to create unique digital maps for shoppers’ physical journey. This is done using a variety of location “signals” including GPS and geofences for outdoor locations like parking lots, malls, parks etc, and using WiFi and BLE for indoor locations such as retail stores. 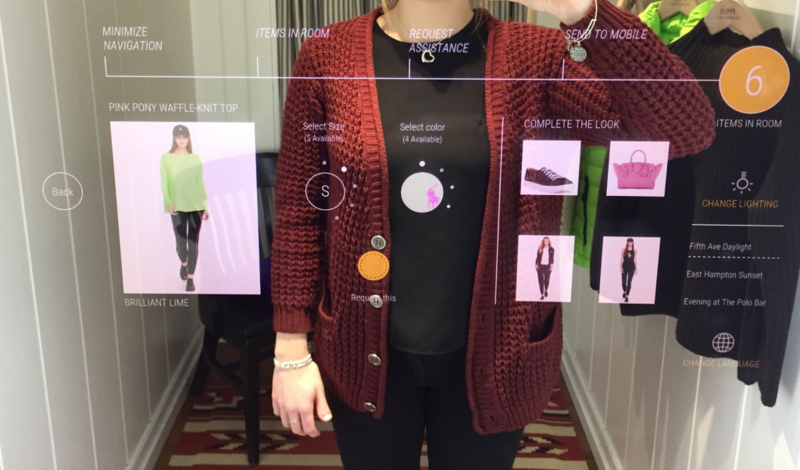 Memomi’s digital imaging software platform enables retailers to deploy interactive mirrors in stores. The technology uses cameras and smart mirrors to deliver a futuristic in-store shopping experience to customers. 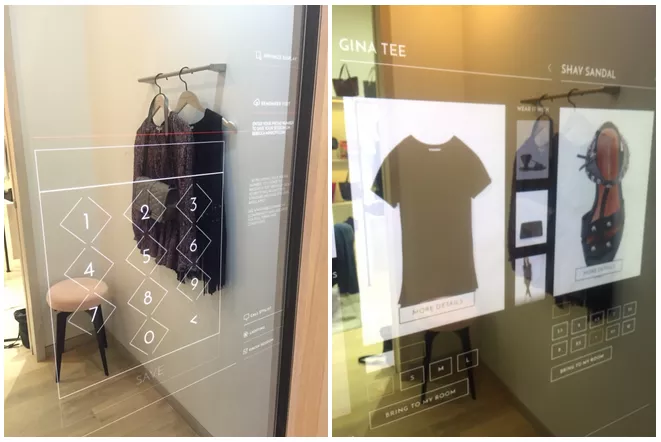 Using simple body gestures and smartphones, customers can virtually try on clothes, change colours and even get a 360 view of your outfit, all in real time, eliminating the dilemma of running back and forth from the trial room. Authentic or Not builds microchips for apparel and fashion brands to help them participate in the IoT. By embedding their microchips in apparel and other merchandising brands, Authentic or Not claims to bridge the gap between technology and fashion. Consumers can hover a smartphone in front of microchips-embedded clothes to verify their authenticity. Their solutions can also be used for anti-counterfeit checks, logistics management and even for upselling products. Queuehop provides retailers with smart ‘anti-theft tags’ that brands can use to augment customers’ shopping experience. Consumers can pay for the products using Queuehop’s in-store kiosk or a smartphone. Once the payment is complete, customers can unlock the tag and simply walk-out. A DIY approach to finding clothes, payment and self-checkout, the patent fashion technology helps customer hop those long queues with faster checkouts.